Tom and first graders show off their new picture book. Tom usually visits a school for the entire day or days. Each day includes three hours of performing during school hours. His first day begins with assembly programs followed by classroom writing workshops. These three hours of performing can be scheduled throughout the day. When not in a class, Tom sets up in the library and works with children in small groups or one on one. ​​ If you want to do part of a day, (just assembly programs), that can also be arranged. ​ Usually an hour in length, assembly programs are designed to help children with their writing and to encourage reading. Each Assembly begins and ends with a story. For younger audiences the second story features extensive audience participation. The centerpiece of each assembly is a story building activity in which Tom teaches everyone how to generate effective writing through a Story Building /Writing activity. Tom and the audience create an original story and he asks the teachers to make a list of all of the ideas for the story. Then, on the count of three, Tom asks all of the teachers to tell the story out loud, all at once. It is most effective – an oral first draft. The children and the teachers learn a simple approach to generating original writing. Tom provides teachers with a Teacher's Guide. Workshops are classroom-based. You can double two classes into one room. The workshops are focused to the age participating with workshops for K - 8. Workshops have proven to be an inspiring way to prep children for writing tests. Tom’s first visit with any class is a direct follow-up to his assembly program. For subsequent visits (during residencies) teachers are free to choose the focus of the visit. Tom workshop menu includes Creating First Sentences, Writing From Prompts, The Art of Details, Poetry Writing, Creating Classroom Picture Books, Biography and Autobiography. ​ During this entertaining and highly interactive workshop, teachers sample techniques for generating writing. These techniques can be adapted for use with all grades and all levels of ability. This section of the program includes tips for writing from prompts, including reluctant writers and creating classroom picture books. In the second half of the program Tom addresses the many aspects of revision including sentence length, word selection, and dialogue. You can peruse Tom’s Teacher Guide by clicking here. This workshop can be of any length and for an audience of any size. Tom has worked with audiences up to 1,000. Lively interactive exercises and extensive audience participation highlight this program. Teachers learn and test techniques which utilize the input of all of their students in the creation of classroom writing. A six-page detailed teacher guide is provided. Here is a chance to help your children with their reading and writing. Tom leads the audience in a series of activities that will help you become more comfortable with reading aloud at bedtime. He’ll give you keys to telling better bedtime stories and even offer tips for what you do on car trips when you hear the words, "Are we there yet?" In the second half, Tom teaches everyone how to create original stories for telling and writing. Be prepared, this workshop is highly interactive. You’ll learn techniques to help you work with your children on building stories for writing and take away helpful tips on how to assist your children as they work on at-home class projects and book reports. Ninety minutes (It's adjustable.). Audience can be of any size. Note: This workshop can be done for parents alone or with children and parents. ​Listening stories, audience participation tales and story building. Parents keep the idea list as all of us build a story. Then each list keeper has to share our story out loud with their family. Some schools have used Tom’s show as a kick off for a Reading at Home Initiative, others have held it as a fundraiser, still others have named it Bedtime Stories and everyone wears pajamas. Between tales Tom shares messages about books, reading at home with your kids and tips on helping at home with writing assignments, book reports and special projects. A residency runs for three or more days, usually a week, sometimes several weeks. Tom works with the school to customize the entire visit. Every child attends at least one assembly, every child participates in at least one writing workshop, the teachers receive an in-service training, the parents can attend an evening workshop or an evening program for the entire family. When not in a class, Tom sets up in the library or an empty room and is free to work or visit with children in small groups or one on one. You may be surprised at the cost. Tom discounts this program because it is his favorite. 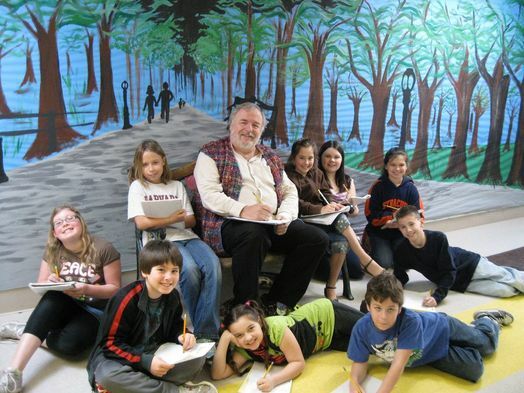 Tom has conducted residencies in hundreds of schools. He is extremely flexible and adapts easily to each school’s environment. Tom conducts a writing workshop for children (parents can attend as well.) We create an original story. Each participant creates a page. They write at least one sentence. They then draw an illustration while Tom goes about and helps each participant edit their sentence. Participants copy over their sentence onto a slip of paper. When the pictures are complete, each participant glues the picture and the slip of paper onto a larger piece of paper. After a break Tom presents a storytelling program with the pages of the new book displayed in sequence along the wall behind him. The children are free to take their pages home. Some librarians have scanned the pages during the break, printed the scans, bound them and added the new book to their library’s collection. Needless to say, Tom includes lots of audience participation. Everyone joins in the telling of the tales. Each year for the last 20 or so, First Night in Northampton has asked Tom to create an original storytelling program just for adults. His repertoire is quite extensive. He has a collection of true love stories, a whole rash of family stories including The Queen of Filene’s Basement, The Kitchen Table, and My Father’s Mistress Had Four Tires; and Sea Stories. If your group is in the mood for a delightful evening of listening and laughter, you can’t go wrong. Through the years Tom has presented at a wide range of conferences: Regional Reading Associations, Title 1 Conferences, State-Wide Library Associations, Pre-school and Day-Care Providers, State-Wide PTA Meetings and the International La Leche League Conference. If you are planning a conference, Tom will gladly put a proposal together for you. Planning a special event? Looking for something unique? Tom might have an idea. Drop him an email. Through the years he’s performed on board ships, at retirement parties, Christmas gatherings, in hay wagons for Halloween... He has even researched, created and shared stories based on the history of a particular not-for-profit or civic group for annual meetings or anniversary celebrations.